Oaklavía (pronounced ohk-la-VEE-ah) is Oakland’s Open Streets Initiative modeled after “Ciclovia”, which originated in Bogotá, Colombia. It is a movement that has spread around the world from Tokyo to Kiev, and to cities throughout the US as a day to enjoy free health- and community-oriented events on city streets temporarily closed to auto traffic. Open Streets like Oaklavía are unique: Events are non-commercial (no on-street vending except for food), and are focused on getting you to PLAY and to MOVE! You’ll experience the roadway differently, as a people-centered public space that is calm, vibrant, and imaginative. 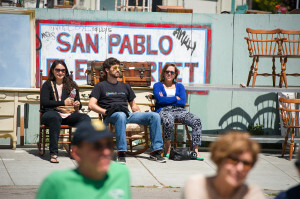 What a year it was for Open Streets in Oakland and the East Bay in 2015. Here are the plans for 2016. 1. Oaklavía took over State Hwy 123, aka San Pablo Avenue on June 4, 2016: Love Our Neighborhood Day, to host safe, car-free fun for kids and adults of all ages and abilities. Cities of Oakland, Berkeley and Emeryville showcase their best local performers, food, art, recreation, sports and creative play. 2. On October 16, 2016: Sunday Streets Berkeley returns to Gourmet Ghetto and Downtown Berkeley to re-enact a wildly successful takeover of Shattuck Avenue. Be part of the planning team. O aklavía connects all who live, work and play in Oakland with the many community organizations, business owners, entertainers and performers, and neighborhood groups that showcase our city’s diversity, creativity and spirit. 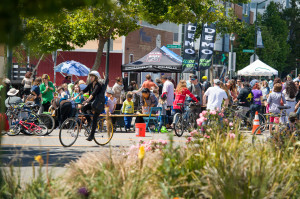 In collaboration with the North Oakland Neighbors, Downtown Berkeley Association, North Shattuck Association and Livable Berkeley, this trio brings joy and community connections to 80,000 to 100,000 people each year. Walk Oakland Bike Oakland is the organizer of Oaklavía and Sunday Streets Berkeley. The inaugural Oaklavía event in 2010 brought over 4,000 people into the heart of Oakland to experience the city’s best natural and architectural assets, outdoor activities, and arts in some of our most well-loved and unique streets and neighborhoods. We can’t wait for you to experience and be part of the 2016 season. Help keep the Open Streets movement alive. Donate now. Email info [at] wobo [dot] org to inquire about sponsor benefits from $250 to $20,000. Love Our Neighborhood Day Oakland from DGindi Streeter on Vimeo. 2015 was an expansion year where our production team partnered with the City of Berkeley to produce 2 Oaklavia events and Sunday Streets Berkeley. 2014 was the inaugural multi-city event in Golden Gate (North Oakland) and the City of Emeryville, called Oaklavia – Love Our Neighborhood Day and the return of Oaklavia – Love Our Lake Day with an updated route. In 2013, Oaklavía – Love Our Lake Day closed three miles of streets circumnavigating Lake Merritt to car traffic, allowing participants to experience what a people- and community-centered urban space can feel like when our built environment is committed to safe and accessible places to walk and to bike. Love Our Lake Day highlighted the recent multi-million dollar investments to completely transform Lake Merritt, a transit-, culture- and activity-rich area served by BART (Lake Merritt, 12th Street/City Center, 19th Street stations) and several AC Transit bus lines. More info about the 2013 event here. See videos and photos HERE. Oaklavia is part of a worldwide “Open Streets” movement. See a brief story about the rise of Open Streets. Open Streets around the world have shown positive outcomes for both the community and businesses alike.